"Admirable playing from the engaging and lyrical David Kirby"
A world authority on Poulenc, international prize winning clarinettist David Kirby has a passion for lesser known works in the repertoire as well as its leading lights and is an enthusiast for English music. Read more. 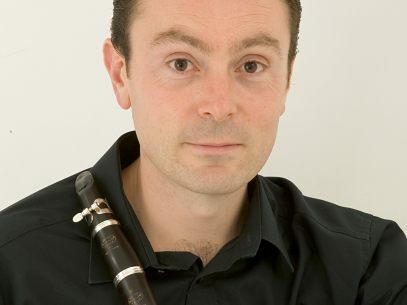 The international prize winning clarinettist David Kirby has been busy for more than twenty years with recitals throughout Britain, Europe and America. He has presented world premiere performances of a variety of works including three from the esteemed composer Brian Chapple. These were recorded on David's first CD, English Clarinet Music, alongside the beautiful Five Bagatelles by Gerald Finzi. Brian Chapple said the recording demonstrated "terrific playing". Gervase de Peyer, the greatest living English clarinettist, said that the recording was "excellent". David has given recitals at many festivals including the Edinburgh Music Festival and The Britten Festival where The Essex County Standard described his playing as, "impressive. remarkable control". In Budapest David has given performances of Krommer's Double Concerto with the internationally renowned soloist Kálmán Berkes as well as recitals at the major artistic venues in Hungary. In recent seasons he has also given several performances of the Mozart Concerto at St John's, Smith Square and in Hertfordshire and has played recitals from Cornwall to Cumbria. David also devotes his time to educational work, and has performed in more than five thousand schools on behalf of the Young Person's Concert Foundation, bringing live performance and demonstrating his love of music to over 25,000 children and young people. He has also recently been invited to return to the United States to give a series of lecture recitals. David's repertoire encompasses the classic clarinet repertoire from Brahms to Poulenc as well as introducing audiences to lesser known gems by composers including Busoni, Gould and La Rocca.